A year ago, the Edmonton Oilers entered the year with a centre depth chart featuring Ryan Nugent-Hopkins and Sam Gagner (both injured) in the top two jobs, Mark Arcobello as a fill-in, Boyd Gordon in the third-line job and Will Acton on the fourth line. The results weren’t pretty. Where do they go from here? 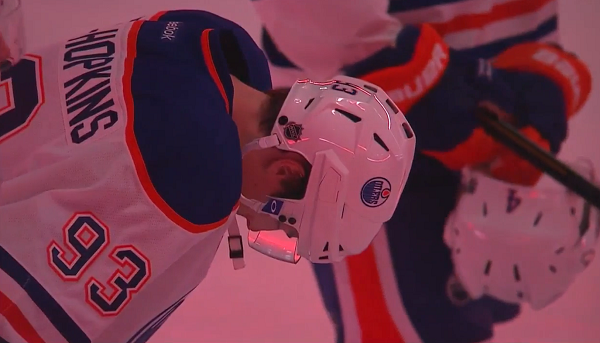 The first-line job seems destined to remain with Ryan Nugent-Hopkins. I’ve heard some complaint about that from Oilers fans – the consensus seems to be that he isn’t big enough – but this is what happens when a team does the kind of scorched-earth rebuild the Oilers have engaged in. Young players get pushed into hard jobs before they’re really ready for them. Nugent-Hopkins is a special player; I think everyone realizes that. He’s a good bet to grow into the role and it’s difficult to see the Oilers finding someone better than him over the summer (Jason Spezza, to pick the obvious choice, would be a nice fit but he’ll be costly to acquire and he’s a year away from free agency). Barring something very unexpected, the Oilers’ best play is to leave Nugent-Hopkins in the top slot. Boyd Gordon did a nice job in a tough role last season, but in a perfect world he slots in on the fourth line next year. The Oilers need to get some offence from their third line, and that would be helped immensely if the fourth line can take a pile of defensive zone draws and take some of the ugly defensive work away from the top-nine. 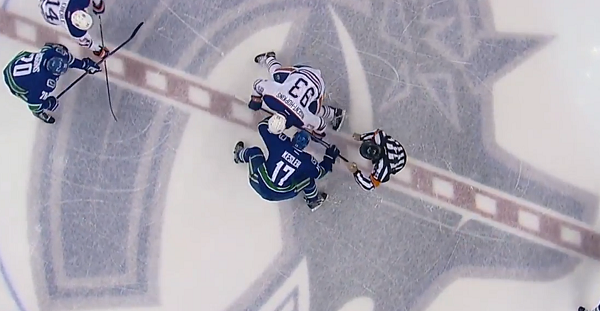 With Gordon and Matt Hendricks, that’s a real possibility. Sam Gagner has been traded on the internet countless times over the last couple of years, and this summer it seems a good bet that he’ll be traded for real. He’s a better player than he sometimes gets credit for, but he has significant issues and an injury at the start of last season helped highlight those. 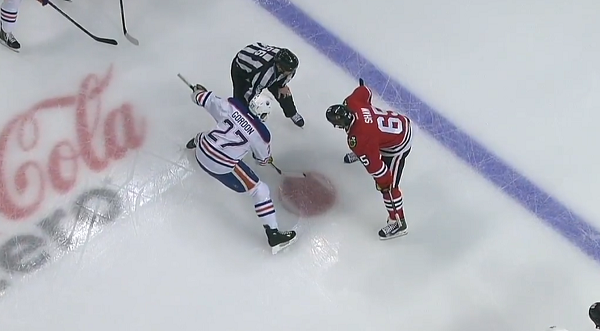 In the unlikely event that Gagner stays, he’ll centre a protected scoring line. If he’s dealt, it will likely be to a team with a surplus of checkers and a need of some scoring. The names generally mentioned in rumour are guys like the Islanders’ Josh Bailey (6’1”, 194 pounds, career-high 38 points) or Nashville’s Colin Wilson (6’1”, 216 pounds, career-high 35 points). The upshot is that the Oilers could end up with a second-line centre, a third-line centre, or something else entirely there. 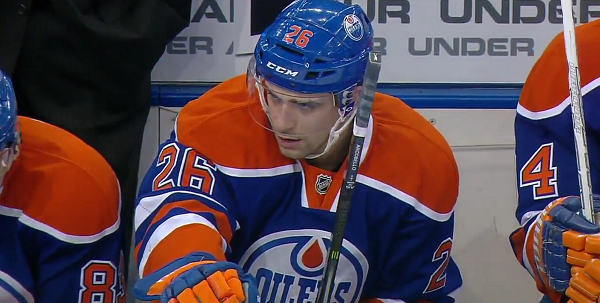 Mark Arcobello and Anton Lander were both re-signed by Edmonton. Arcobello is a gifted offensive centre who showed a capacity to do a lot of different things last season, but it wouldn’t be a surprise if there was some hesitancy by the Oilers to pencil him into their top-nine. Lander is a gifted defensive centre who has struggled to convert his game to the NHL level; if he’s in the starting-12 it will likely be on the fourth line. The Oilers also currently hold the third overall pick in the 2014 Draft, and the most likely selection is a centre. If the Oilers come away with any of Sam Reinhart, Sam Bennett or Leon Draisaitl that player would likely be bumped immediately to the NHL as the centre of a protected scoring line – perhaps with Nail Yakupov on one wing and a veteran defensive winger on the other side. Edmonton won’t be able to finalize their plans until after this summer’s entry draft. If they add a centre, there really isn’t much room for Gagner, and trading him for a third-line pivot (and bumping Boyd Gordon down to the fourth line) makes great sense. If, instead, the Oilers add a defenceman via the draft, things get more complicated. My guess is that they would still attempt to move Gagner for a third-line pivot and then try to find a replacement second-line centre via free agency. The only certainty here is uncertainty. As Kevin Lowe might put it, expect the unexpected. Which unrestricted free agents will the Oilers retain? Totally agree that RNH should be developing in 2c and Gordon should be a very capable 4c, but lack of depth forces them to be slotted a peg too high. A big problem is that there is no one to play with Yak in top 6. RNH can’t carry Yak. Gagner or a rookie 2c certainly can’t carry him either. 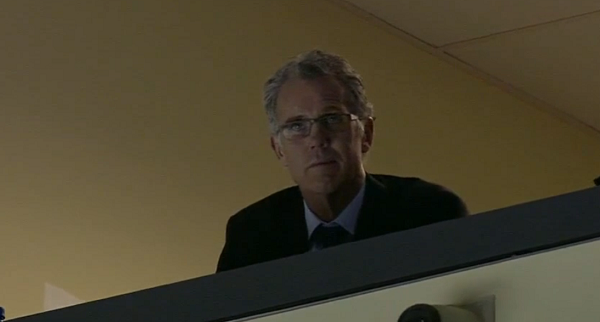 So – if MacT can’t find a Yak solution, it is gonna be painful to watch him flounder for another season. Why should anyone need to be “carried”. If a player needs to be “carried’ he shouldn’t ne on the team. Unfortunately the Oil have a number of players who need to be “carried’. IMHO. I think the money paid for MH is money well spent. It is money paid for passion,accountability and commitment to team. It is money spent on teaching some prima donnas that you play each shift like it is your last,that the first period is just as important as the third. It is money spent to fear the young players into competing for crest on the front not the name on the back. Scoring points are nothing,teams points are why you play the game. Everyone seems to forget Gordon’s usage. He’s a third line pivot. 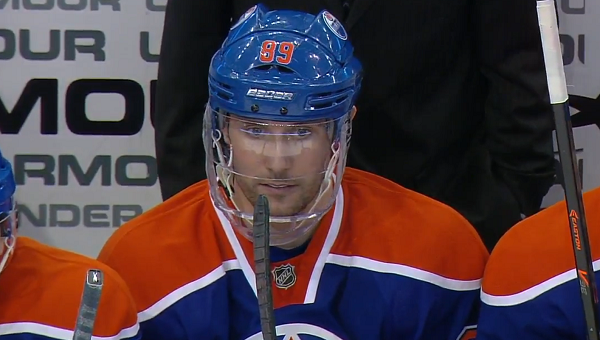 Nobody is going to score much being used like that on a team like the Oilers. If they get a second line centre that can actually play and better wingers for the third line, Gordon can be given a more normal work load and the third line points will come. Something I haven’t seen brought up is the impact of the new face off rules will have on his effectiveness at the dot. The answer is starring us right in the face on a second line center………..let’s see Arcebello played light-out last year, was our most productive hitter, and was defensively sound. He get’s rewarded by being sent to the minors, where guess what, he excels. Yes he may be small ( look at the Habs) but he plays big and is very effective……..if our uber intelligent coach has any sense, he will play him. I have no doubt this guy can play……..I have many doubts about our coaching! but Arco is not a 2c, I would use him on the 3rd line no problem though. MacT should be on the horn to see what itll take to get Stastny from Colorado before he hits the market. His point production would state otherwise……….you don’t take an offensive player deploy him on defensive line, and then expect him to succeed. This is what the Oilers have been doing since Eakins arrived. Expecting a player to succeed playing out of position and role is sheer madness! Let’s trade your 2015 first round pick to the Flames for our first round pick in 2015!!!! Before the season even starts. You would actually create a desire to win in Edmonton for the first time in 8 years! If Hendricks and Gordon are on your teams 3rd line with a healthy line up, your teams GM is an idiot.